"Everything's Rosie!" is a brassy, sassy, swinging 90th Birthday tribute to Rosemary Clooney. 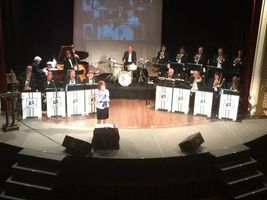 The classy R. L. Big Band, featuring Nancy James, will fill the Sorg Opera House with an hour and a half of Clooney’s greatest songs. Backed by some of the areas best jazz musicians, Nancy James, who studied at Cincinnati’s College-Conservatory of Music (CCM) in Cincinnati, has been a popular jazz vocalist in the area for three decades, having performed on television, radio and on stage. Doors open at 7:00 p.m. for the 8:00 p.m. show on Friday, October 19. Advanced reserved seats are $25.00 and are on sale now through CincyTicket.com. Tickets are $30.00 at the door.